Let’s make some cute projects!! This class features the fun Animal Outing Stamp Set, Frames Elements, Animal Expedition Designer Series paper and Animal Friends Thinlits Dies. You will need Berry Burst, Lemon Lime Twist and Early Espresso ink for this class to go. You will also need a Crushed Curry Watercolor Pencil and and Aquapainter (or a Crushed Curry Stampin’ Write Marker). I recommend using Snail Adhesive to assemble your projects. You will also need Stampin’ Dimensionals, Mini Dimensionals and Mini Glue Dots. This is the full Class To Go Kit. 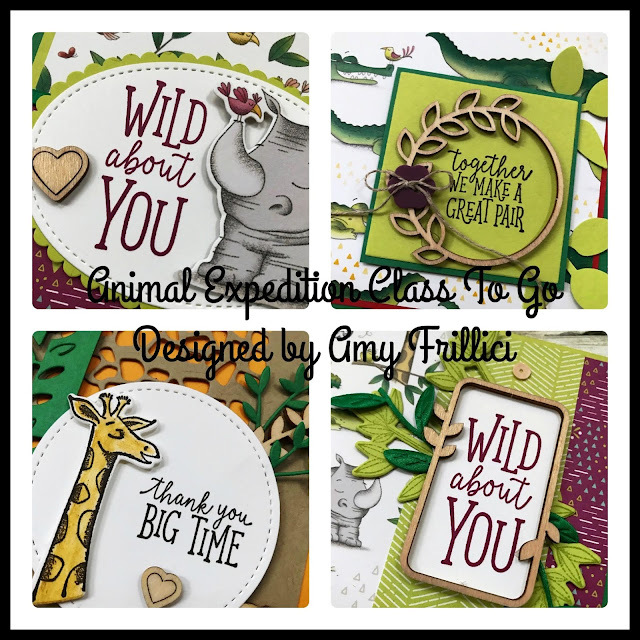 It includes the Animal Outing Clear-mount Stamp Set, Animal Friends Thinlits, Frames Elements, ¼ pack of the Animal Expedition Designer Series Paper and Make & Take materials for all eight (2 each of 4 designs) cards. And… I’m throwing in a bolt of Leaf Ribbon For FREE!! You will also receive the full PDF tutorial. Email me for the registration link at amy.frillici@yahoo.com. This is a partial Class To Go Kit. It includes the Animal Outing Clear-mount Stamp Set (no Animal Friends Thinlits – we’ll do your die-cutting for you), Frames Elements, ¼ pack of the Animal Expedition Designer Series Paper and Make & Take materials for all eight (2 each of 4 designs) cards. You will also receive the full PDF tutorial. Email me for the registration link at amy.frillici@yahoo.com. This is a partial Class To Go Kit. It includes Frames Elements, ¼ pack of the Animal Expedition Designer Series Paper (no Animal Outing Stamp Set - so only choose this option if you already own the stamp set and no Animal Friends Thinlits – we’ll do your die-cutting for you) and Make & Take materials for all eight (2 each of 4 designs) cards. You will also receive the full PDF tutorial. Email me for the registration link at amy.frillici@yahoo.com. Inkspired Stampers Members (my downline) can purchase this option for the make and take kits and PDF tutorial. Want to join my team and get all my class kits at a significantly low price? Details about purchasing the Starter Kit can be foundhere. Registration will close on Friday, December 21. Expected shipping date of all kits is January 4.